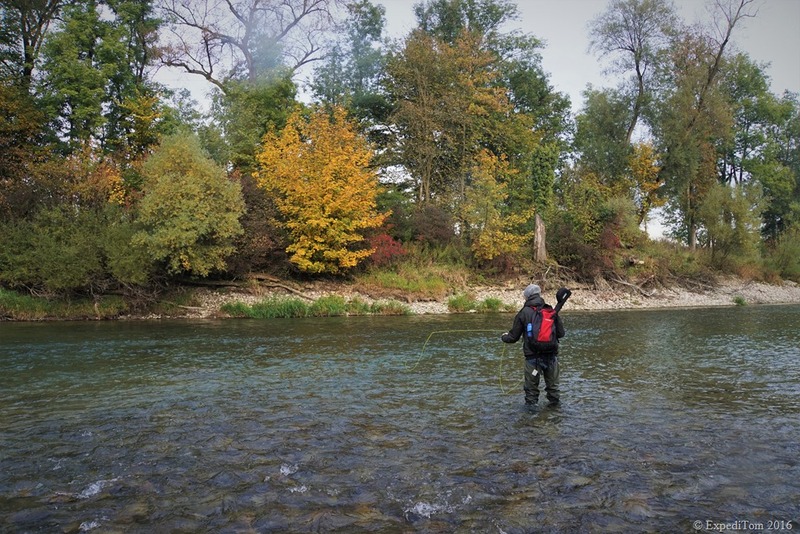 On a foggy autumn day, I went fly fishing for grayling in Switzerland with André and Dominik. Not only did we encounter a small hatch of mayflies, but caught also some beautiful grayling. 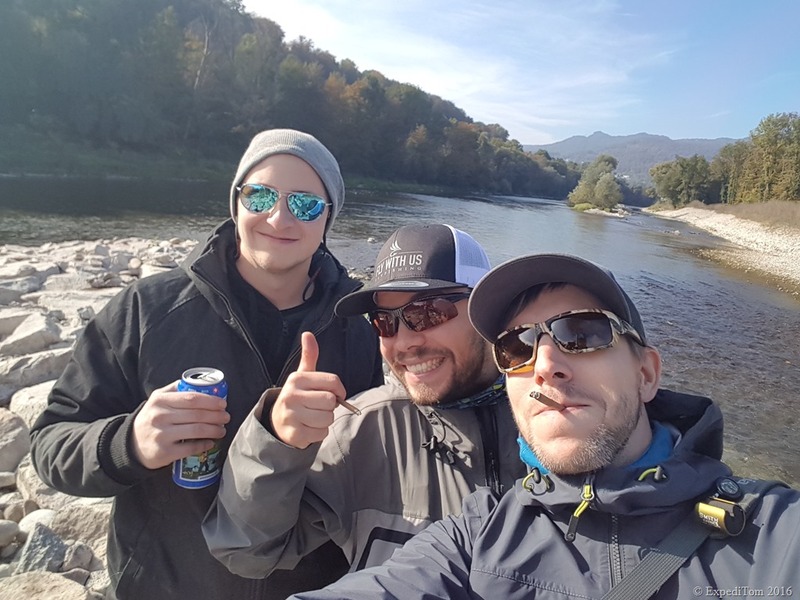 Dominik, André and I met at around 1 o’clock in the afternoon at the river to go fly fishing for grayling in Switzerland. Instead of fishing during the early hours as I did on a previous trip, we decided to go when the temperature was at its peak because more insects should be around. 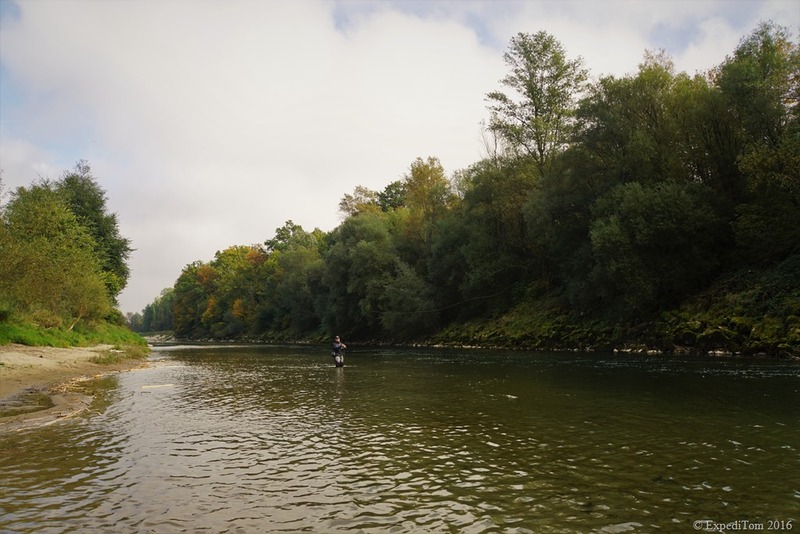 Whereas André is an experienced fly fishermen, who you might recognise from the post about exploring Jura mountain creeks, Dominik is a novice to fly fishing. As a result, my personal goal for this day was to make Dominik catch at least one fish. After we started wading upstream, it was not long until we came across the first sighted fish. It was a group of barbels. André had already successfully fished for the so-called ‘poor-man’s bonefish’ in another river in Switzerland. Hence, he tried to get them with a heavy nymph rig. However, Dominik and I pushed further upstream. I fished a size 18 olive dun parachute fly with a 15 foot leader and 6x tippet. 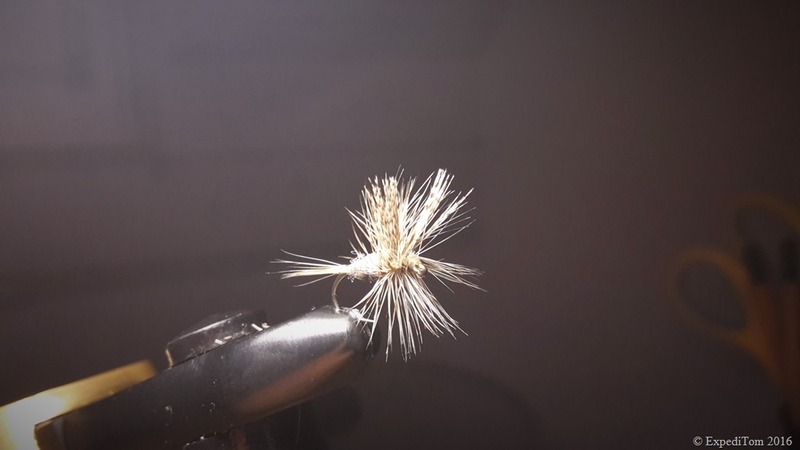 Dominik used a dryfly-dropper rig with a gold bead nymph. We worked our way up while André was focussing on the barbels. 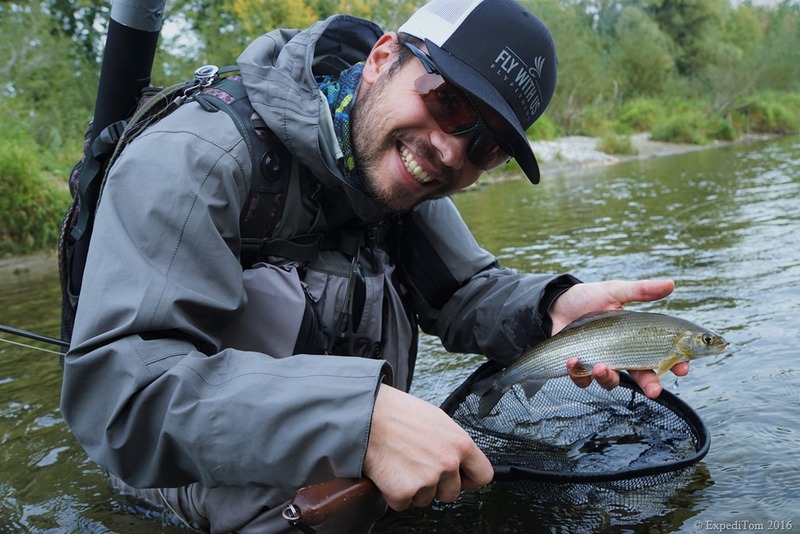 Fly fishing for grayling in Switzerland is quite popular among anglers here. 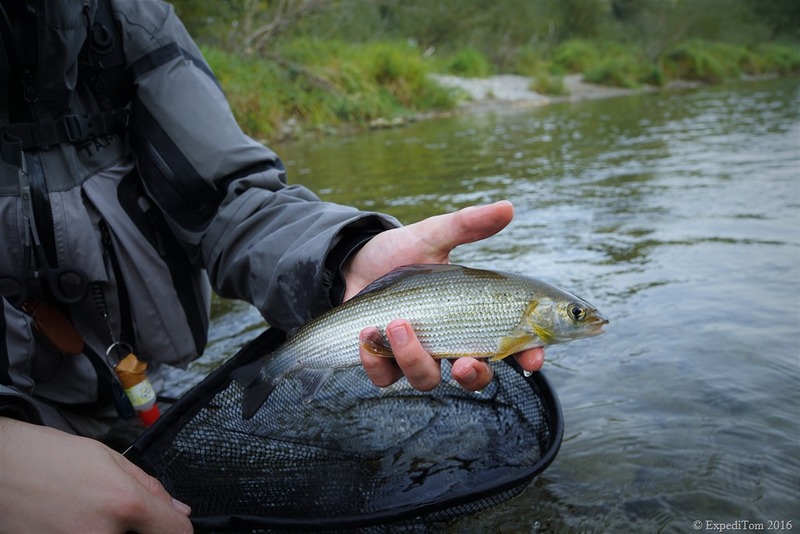 Grayling is a delicious food fish with a distinctive thyme taste and can be caught in several rivers throughout Switzerland. 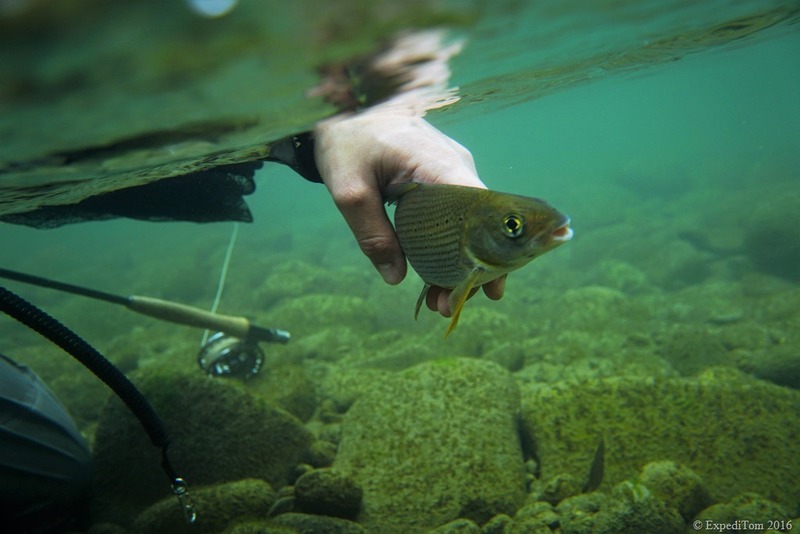 Most anglers focus on the grayling in autumn from October to December, depending on the regulations of the different Cantons (=provinces). 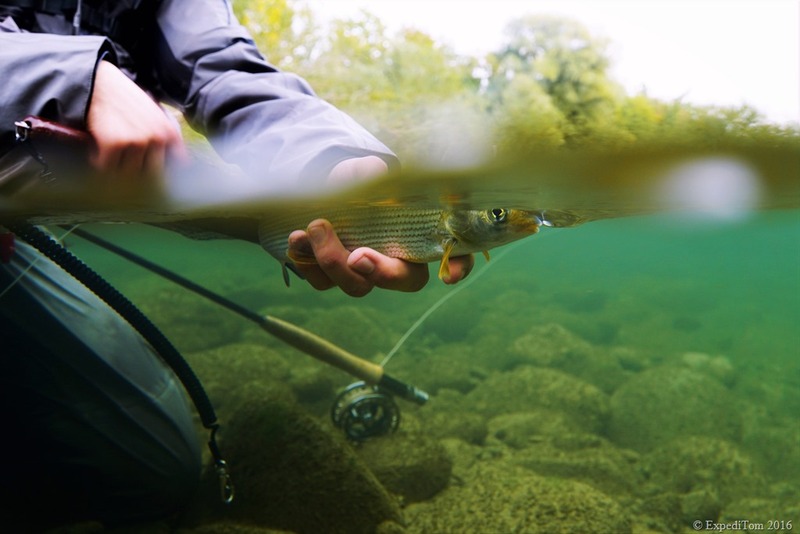 Given that the trout season ends in Switzerland on the 1st of October, grayling become the main target of fisherman. 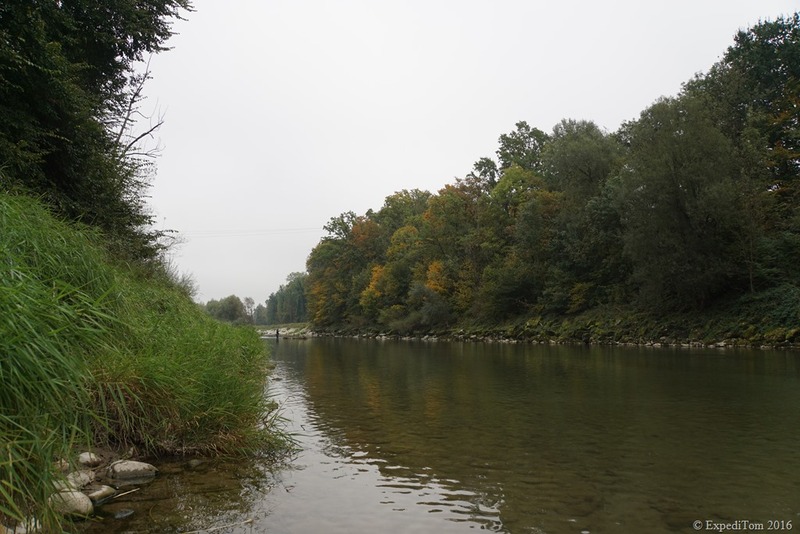 A pretty famous river to fish for grayling is the Aare in the Canton Bern around the Felsenau. Unfortunately, such places experience high angler pressure and Catch and Release is not encouraged. However, at certain places one can still fish for grayling in Switzerland and still be on your own. Or with two lads – as I was. 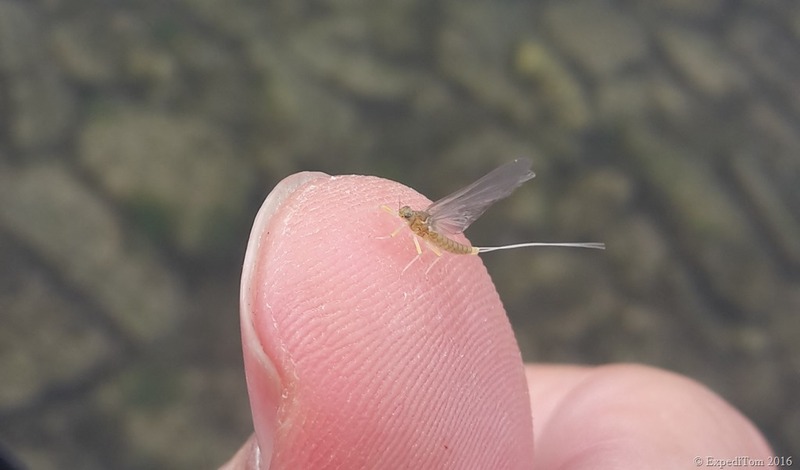 After about an hour fly fishing for grayling in Switzerland mayflies began to hatch very frequently. I had never witnessed such a spectacle at this place before. It was not long, until the grayling started to rise. Surprisingly, they were pretty close to where Dominik and I stood. Presenting a tiny size 18 olive dun mere a few metres away brought the first small fish to the net. I was surprised that I hooked the minute grayling of 20 cm because this was a huge issue on the previous trip. More on that later. I switched the rod with Dominik so he did not have to change his rig. Moreover, I hoped to make him catch a fish. Although he had several takes, setting the hook proofed to be difficult. 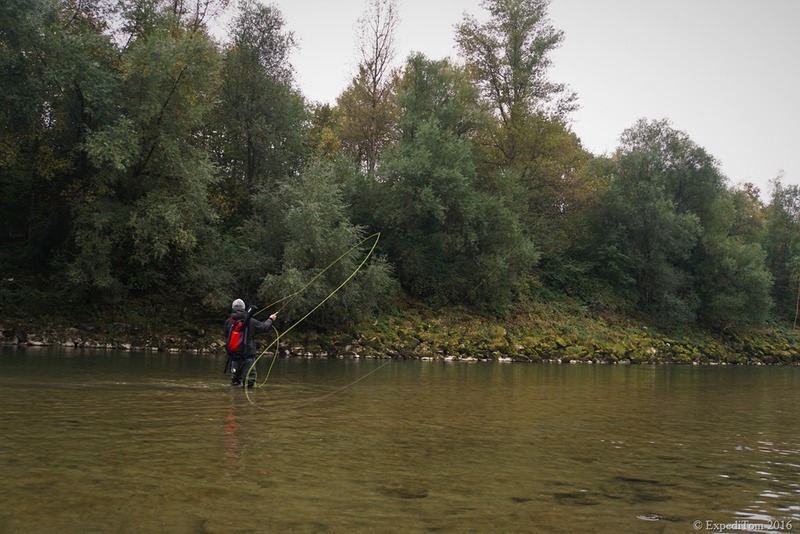 While Dominik was still trying, André caught up with us without having hooked a barbel. He casted some dries into the riffle, but could not realise any takes too. We explained the lost fish by their small size and headed to a river bank for a break. There we enjoyed a beverage while sighting feeding chubs in the shallows. Another pool probably contained only small grayling as well because the plentiful takes were very acrobatic and resulted in no hooked fish for André and me. We ventured all together further upstream until we reached another promising looking pool. This pool had a distinctive bubble line which often indicates where grayling are hiding. I fished a size 16 Adams and after one lost grayling during the fight, the second grayling came to the net. Due to the insufficient size we gently released it back to the river. My favourite riffle to go fly fishing for grayling in Switzerland was yet to come. Full of enthusiasm we waded through a section of the river where we had to be careful not to be washed away by the river. The crossing here is only possible when the water level is very low. For Swiss water levels of certain rivers check the homepage of the BAFU (i.e. department of environment) before you go. Not hooking fish seemed to be the theme of the day while fly fishing for grayling in Switzerland. I had made this experience as well on a previous trip when I had messed up more than a dozen fish. During that trip I had pressed for hooking a fish. I had tried setting the hook instantly or with a short hesitation, standing further downstream to pull the hook into its mouth and I had even changed the fly four times. Nothing had improved my statistic of hooking only 10% of all grayling takes. Therefore, it was relieving for me that on this trip now all of us had to cope with this misery. Yet, I did not begrudge any catch to my fellow fly fishermen. At my favourite pool the three of us stood 15 metres apart from each other fly fishing for grayling in Switzerland. Somehow, this reminded me of the Bridge Pool at the Tongariro River in New Zealand, where heaps of fly fisherman stood in line every morning. However, this time I knew all of my fishing blokes and so it was fun to fish together with them. André continued casting across the river. He counted already no. 3, while I went ahead with Dominik to a drop-off where grayling usually like to hide very close to the river bank. Thus, one did not need to cast very far. 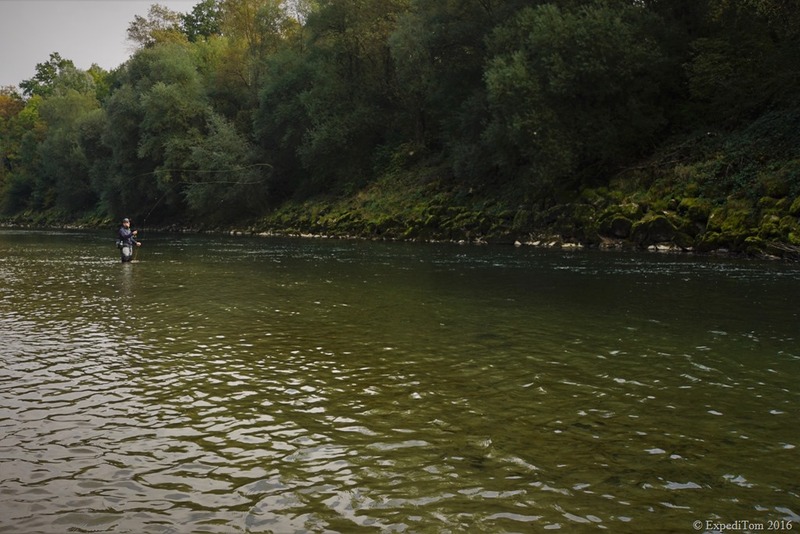 Dominik casted into the upper current where the fly was washed down to the drop-off and on the second cast a fish rose. This continued repeatedly. Interestingly, the grayling eagerly followed dries which were fished like wet flies: on the swing. Hence, I supposed they feed as well on emergers. André counted already no. 8 when from the corner of my eye, I saw a large fish rising in an eddy further upstream. Only the head of the fish pierced through the surface of the water. Immediately, I told André where the rise had been. 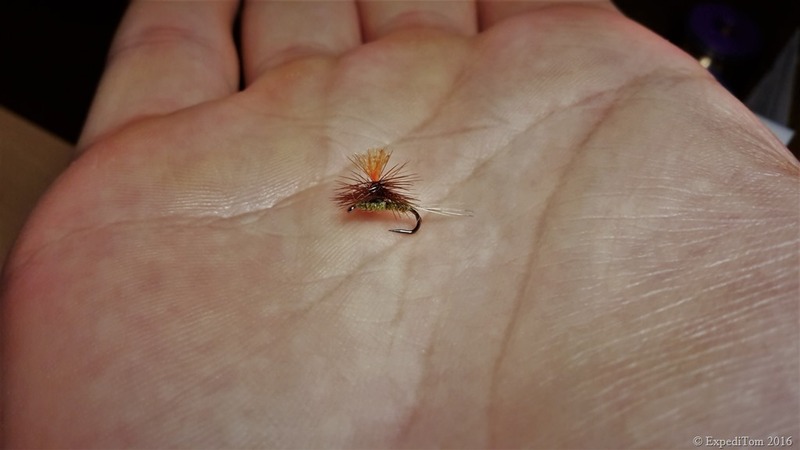 He came over and casted a tiny CDC dry-fly 4 meters ahead of the place where the fish had risen. Several times the fly was dead drifting perfectly and the fish must have seen it. Yet, the grayling ignored it. Subsequently, André went a few metres upstream and continued fishing. Seeing Dominik self-absorbed at the drop-off and André being occupied as well, I started fly fishing the eddy myself where the big fish had risen before. I still fished the size 16 Adams with mallard wings and began casting across the river. Four times the fly drifted over the supposed hiding place of the fish. André laughed and counted no. 14 who got away. Such a pity. A splash brought my thoughts back to the grayling. A splash brought my thoughts back to the grayling. The fly was eventually sipped in by that very same grayling I had been observing for a while. I set the hook and I finally felt a decent fish. I ran downstream to get below the fish in order to pull the hook into the mouth instead of out. Dominik still stood at the drop-off, which was on my way downstream. I told Dominik to pull in his line so that I would not get stuck. The fish made a few more attempts to escape. Thereby, the grayling used his beautiful dorsal fin. Yet, in the end, I managed to land the fish. I shouted for joy. 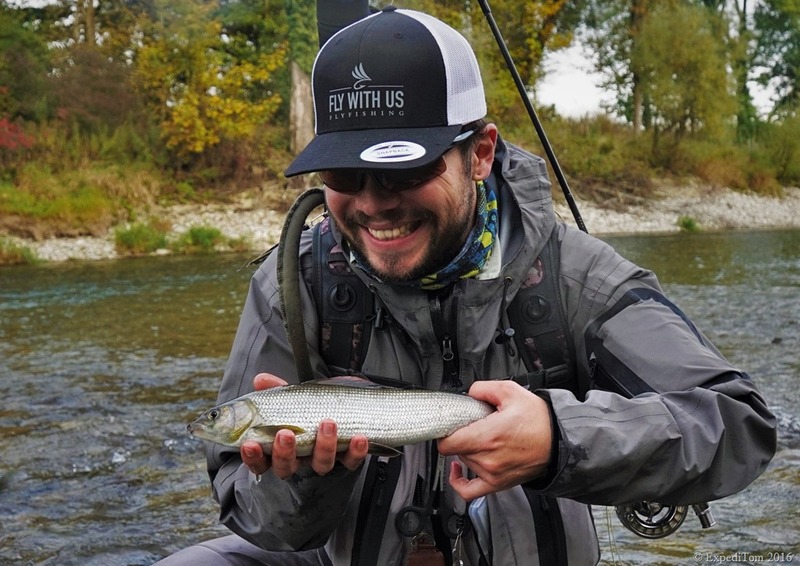 Fly fishing for grayling in Switzerland with Dominik and André was a splendid fishing trip. We all enjoyed great camaraderie and had a lot of laughs. We were blessed with rising fish throughout the day and fished almost only dries. In contrast, the short time we used nymphs did not proof very successful. The casting distance is not crucial, but the better you cast the more fish you reach. Unfortunately, I was not able to help Dominik catch a fish but at least he had some takes as well. Do you lose a lot of grayling too? What are your tactics? What is your favourite grayling fly?